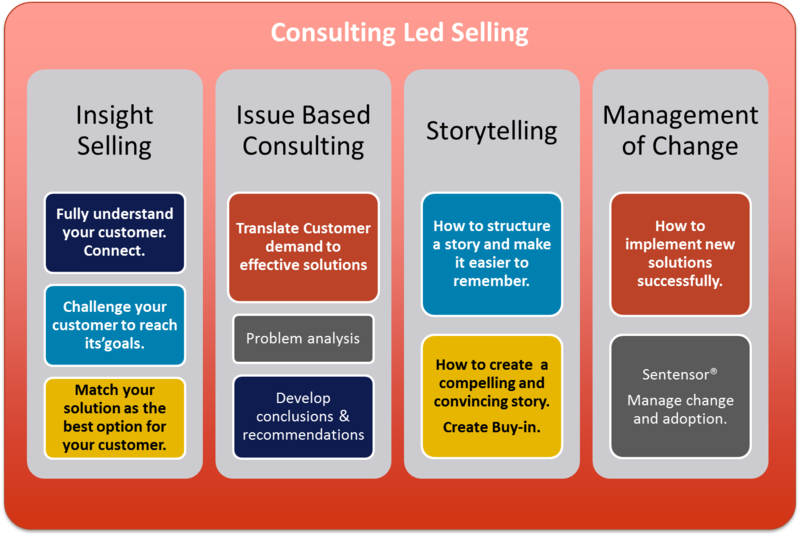 Consulting Led Selling is a business strategy that leads to the increase of sales and customer retention. In Consulting Led Selling (CLS) your knowledge and experience is the basis for your business strategy to explore other markets and new clients. This enables you to create a competitive advantage based on your business vision, instead of competing on price. The CLS Framework consists of 4 pillars, all together forming an integrated approach for your business model. These 4 pillars individually are proven concepts where your business and your people will benefit from. Together they will enable you to gain a position as trusted adviser and thought leader towards your customers. Insight Selling : After solution selling, consultative selling and RAIN selling comes Insight Selling. Based on their latest research and published in Harvard Business review, the RAIN group discovered the most effective B2B sales approach. Issue Based Consulting : The most used effective, professional consultancy approach available at the moment. As being used by many reputable Consultancy firms like McKinsey, Booz & Company, PriceWaterhouseCoopers and IBM Consulting. Storytelling :How to convince and engage your audience. Turn your idea into actions of others. Management of Change : Manage the implementation and adoption of your new ideas and plans.